Murphy's White Tire Mounting Euro Paste is a concentrate for use in the most challenging applications. 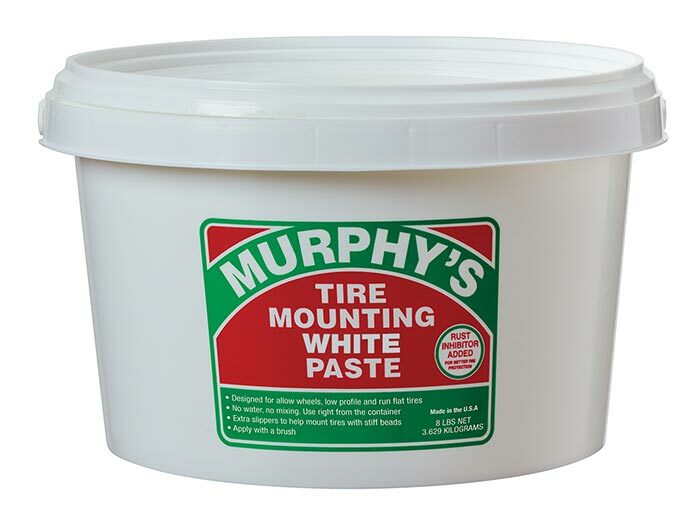 Designed for direct applications, Murphy's White Tire Mounting Euro Paste is a stable blend of specialty soaps, corrosion inhibitors, preservatives, solvents and water. This lube will not cause softening of rubber materials. It can be used in any application where rubber needs to be lubricated relative to its dry state. Murphy's provides low friction to prevent twisting and cracking; therefore tires will not grab or seize onto metal rims. Murphy's will enable tires to seat readily and smoothly. Murphy's White Tire Mounting Euro Paste contains no HARSH chemical components that can cause corrosion of metals or irritation of workers.